This is a great time to be a designer in Dundee, UNESCO City of Design. 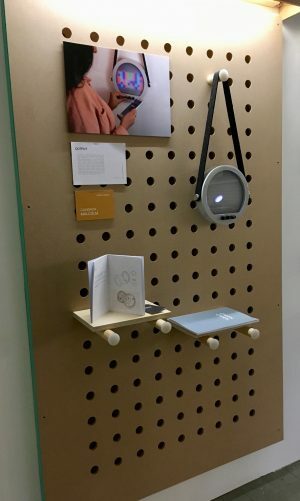 We are now in the midst of the first ever Dundee Design Month, (http://www.dundeedesignmonth.com ) and among the wealth of new events on offer make sure you do not miss the Product Design section of the DJCAD Annual Degree show. As ever, there is an impressive variety of work on display, with designs ranging from the socially aware to those that improve our lives in more hedonistic ways. Perhaps a good example of the latter would be Stewart Carr’s Thermotini, a new kind of cocktail shaker, which uses smart materials to change appearance and colour once the cocktail is ready, an application which could be useful for advertising purposes. Innovations are not limited to human beings; Minrui Jiao has constructed a car seat for pet dogs to allow them to travel safely and in comfort. In designing her product she has had to take account not only of safety and aesthetic considerations, but also the views of two types of client: the pet owners and the canines themselves. Integration of social media into daily life is reflected in several products. Cameron Malcolm, for example, has created a monitor which can analyse your last 60 tweets, enabling you to assess the success or otherwise of your image as presented on social media. The “emotional output” of your twitter account is then displayed on a colour spectrum. Whether this would be reassuring or paranoia-inducing I leave it to you to decide. 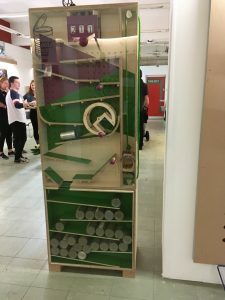 Nearby we find Cameron Watt’s playful “Meta”, into which you insert your phone in order to obtain a receipt displaying the monetary value of your personal data. An interesting combination of both new and old technologies is seen in Robbie Beautyman’s Fore|Sight, which is designed to provide a navigation guide for the visually impaired. It takes a traditional Braille product, a tactile map, and combines them with an audio track using GPS navigation, allowing the user to plan journeys in unfamiliar areas. Technology has also been used to assist autistic children: Sean Gooravin’s Emotional Sides product displays four basic emotions in a hand-held simply shaped octagon which helps children identify and communicate feelings. By way of contrast Dylan-John Gardiner’ s Can Collect point is reminiscent of old fashioned pinball or similar machines. It is a humorous machine with a serious purpose – to encourage customers in supermarkets to donate more canned food to foodbanks. Sarah Hepburn has used her own experience of living on the family farm to create a Drench Pack which relieves backstrain for farmers who have to carry heavy containers of medicine for treating their sheep. 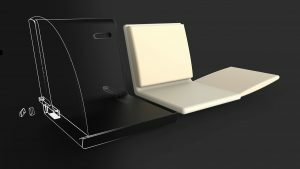 The flexible padded structure is individually tailored for comfortably carrying the necessary plastic liquid container on the back. A different, and very Scottish, kind of container is seen in Campbell Scanlan’s Waulking Cases, instrument cases created using Harris Tweed for musicians working on the contemporary Scottish traditional music scene. Robust in construction they hold a subtle freight of tradition and history. An attractive light for the treatment of SAD (Seasonal Affective Disorder) has been created by Andrew Shearer. A sensor allows the blue light provided to vary according to external light conditions, and the piece itself is stylish, unlike the usual clinically-styled lamps available for this condition.